KUALA LUMPUR (Reuters) – Tens of thousands of Malay Muslims rallied in Kuala Lumpur on Saturday to celebrate the Malaysian government’s refusal to ratify a UN convention against racial discrimination. After weeks of pressure by pro-Malay groups, Prime Minister Mahathir Mohamad’s multi-ethnic government decided last month that it would not ratify the convention, without giving a reason why it was going back on an earlier commitment to sign. Groups reperesenting Malays, who account for around 60 percent of Malaysia’s multi-ethnic population, raised fears that signing the UN pledge could have undermined Malay privileges and threatened Islam’s status as Malaysia’s official religion. Badly beaten in an election earlier this year, Malay opposition parties seized on the issue, along with activists, to organise the rally, as race is a sensitive matter for the southeast Asian nation of 32 million people. 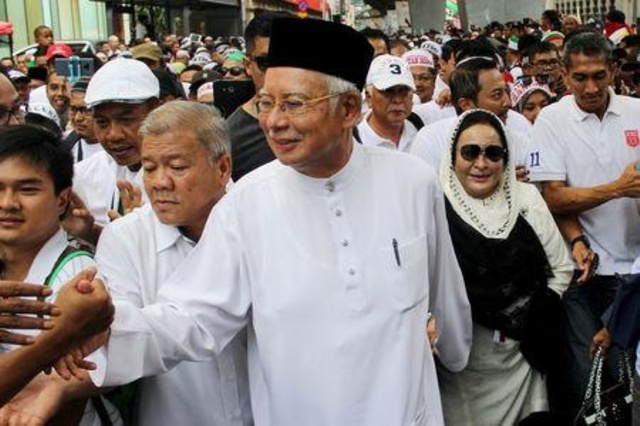 Seeking to rebuild support, Najib Razak, Malaysia’s scandal-plagued former prime minister, and Ahmad Zahid Hamidi, who replaced him as head of the former ruling party, the United Malays National Organisation (UMNO), and the leader of Parti Islam Se-Malaysia, PAS, all attended the rally. Their supporters, wearing white, converged on the capital’s Merdeka Square following afternoon prayers. Some chanted “God is Great” and slogans against the UN convention, while holding up placards calling for the defence of Malay rights and dignity. “We are here to defend our rights as Malays,” said Faridah Harun, a 59-year-old mother of seven, who travelled down from the northern state of Perak to join the rally with her husband. “We have ruled this country very well for a very long time, but now there are people who want to take over and do things like shut down MARA,” she said, referring to a trust fund for Malays and indigenous people. Affirmative action policies introduced after deadly race riots in the late 1960s gave Malays advantages including university quotas, housing discounts, government guaranteed savings plans, and equity ownership quotas. Whereas Mahathir’s coalition enjoyed overwhelming support among voters from the minority ethnic Chinese and Indian communities, who together account for 30 percent of the population, it remains locked in a battle to win over Malays who have remained loyal to UMNO and PAS. In a statement published late Friday, Mahathir said the government had no objection to the rally so long as it remained peaceful and orderly. “On behalf of the government, if the rally is held on the basis of thanksgiving, we are thankful for the support shown,” he said in the video posted on his social media pages. I thought the former Prime Minister and his wife were supposed to be in jail on corruption charges ?? ?